Looking good in Charlotte: Gaze upon it, dear readers. It's the late 1980s, mullets are high fashion, and Kelly Tripucka is rockin' a winner that's matched only by his on-the-court skirt. 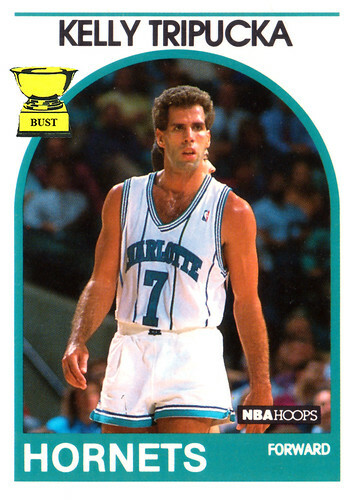 Sure, Tripucka looks like Ben Stiller, but when you have a mullet like that ... what's that? Wait ... a ... second! Holy hemorrhaging hemorrhoids, that's no mullet! That's a conjoined twin bulging from Tripucka's back! The hair from one twin is making it look like the other is all business up front and party in the back. Well, you can't fool the Bust, Ben Stiller. You're stricken from the Mullet Hall of Fame. But, we will give you credit for the chest sweater you're hiding under that tank.